Identify how to conduct scholarly activities in an ethical manner. All three of these learning outcomes will be important to your success here at OSU and to your ability to win and succeed at a professional job/career in EECS after you graduate. The second learning outcome is also required for all OSU graduate students. A passing grade in this course can be used to indicate that you have met the latter learning outcome on your program of study. Deadlines are firm; if you need an extension, it must be approved before the assignment's deadline. Grades to date, as of: 10/2/2016, 10/24/2016, 10/26/2016, 11/2/2016, 11/7/2016, 11/25/2016, 11/25/2016 updated, 11/27/2016, 11/29/2016, 12/1/2016 . Because about 1/3 of the class will be done online via the CITI Ethical Training modules, we'll average only 2 hours per week meeting in person. The meeting schedule below achieves this average. Homework #1 (due Friday 9/30): Take the Harvard unconscious bias test of your choice from here. Turn in your name and the Exact Title of the test you took. Email to Dr. Burnett by 11:59 pm Friday 9/30. Technique #3: find a way to put the ignored person in the spotlight. Homework #2 (due Wednesday 10/5): As announced in class, with your teammate, critique/compliment any one of the job ads using the NCWIT Tips for better job ads resource #1. Format can be annotated pdf or scanned-in printout that you manually annotated. I expect about 3 or 4 critiques/comments (about 1 sentence each) referring to some particular tip on the resource. Email one copy per team (with both your names on it) to Dr. Burnett by 11:59 pm Wednesday 10/5. F 10/21: Writing emails (local copy). Examples. Homework #3 (due Sunday 11/6): From this paper or from something you find with a web search, turn in one concrete example of when algorithmic bias has occurred (about 1-2 sentences), and give the complete paper citation or URL where your example came from. W 11/16: Class: Special time, special location, special speaker: Dr. Safiya Noble's presentation on Challenging Algorithms of Oppression: Black Annihilation and the Internet. Time/location: 3:30-5:00, Valley Library 2nd floor Rotunda. Attending this class will be counted as Homework #4, and attendance will be taken. 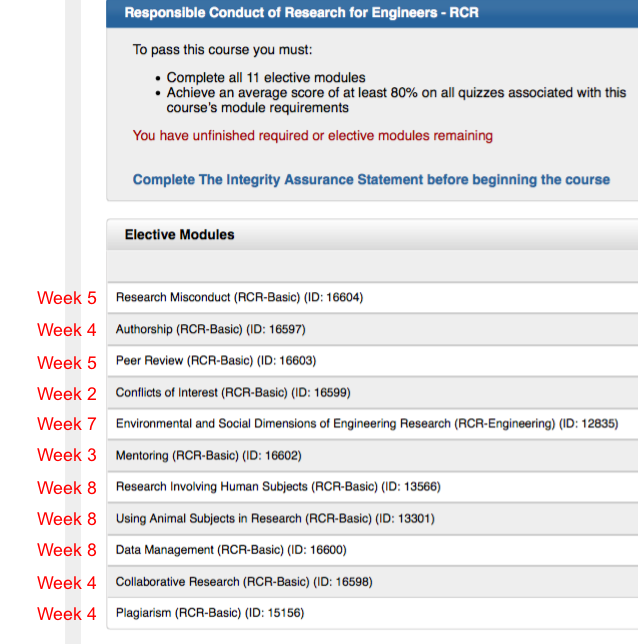 Some of your assignments will add up to passing the online Responsible Conduct of Research (RCR) training. Q: Where to do the assignments? A: here. Q: Which online RCR course? A: Select this one: Responsible Conduct of Research for Engineers. Q: What does "passing" mean? A: You have to get a score of 80% or higher. Q: How to turn it in: A: Email proof of passing the assigned module to Dr. Burnett by the due date (a screenshot from CITI showing that you passed that module is fine). Class requirements: Is CS/ECE 507-002 required for graduation? Top 5 Mistakes dealing with disabled people (2+ minutes: you can start around 35 seconds in). Example paper with mostly good topic sentences but a few examples of bad ones as well (look for red rectangles). To report an incident of harassment, bullying or discrimination at OSU: go here. To report an incident of bias (e.g. due to racism or bigotry): go here. To report an ethics violation at OSU: go here. If you are an instructor, to report a student conduct violation, go here.